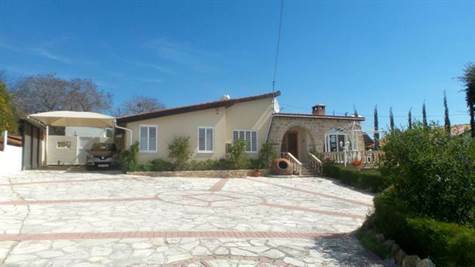 Tala, Paphos - This beautiful stylish home is situated in a quiet residential cul-de-sac within easy walking distance to the local shops and popular village square of Tala. Paphos Town is a 5 minute drive away. A family home for many years, the property has recently been lovingly restored to a high standard using an innovative mix of modern quality finishes. The accommodation is extremely spacious and the included floor plan shows the comfortable layout. The property is ideal as a residential home or holiday residence and has full title deeds. The plot is equally well designed with low maintenance in mind and there are many different outdoor terraces and verandas where you can enjoy the wonderful outdoor life - alfresco dining, entertaining and relaxing. The driveway has space for up to 6 cars and includes a car port to the side. In summary this is a unique luxury home with a delightful ambiance of comfort, peace and tranquility.